Hey everyone, I thought I would just check in with you all and give you a progress update. If you remember from my first blog I had a few targets and goals set for my friends wedding in May…….. I had just started my fitness journey, training with Phil, doing a combination of push, pull and leg work outs. So far I have mastered a barbell squat, deadlift, barbell bench press and much more. I am now approaching the end of week 6. Training with Phil has gone really well and I’m definitely feeling stronger, more confident, and I can definitely see a huge change in my body shape. I have had positive comments from my partner and friends, telling me they can really see a difference, this is great to hear and has really helped to motivate me further, especially after all the hard work. I have also noticed a big difference in my clothes, items that were too tight now fit, while others are now too big, at this rate I can see me needing to do a big shopping trip. I’ve been blown away with my progress, I’m shocked that after just 6 weeks, I look and feel so much better. Don’t get me wrong I still have days where I am craving pizza and chocolate, but I have been able to replace these with healthier options that fit my macros and my taste buds. I can lift heavier weights and I am growing in confidence. I can honestly say, this is the first time in ages that I think my body actually looks good. Tracking my food and being compliant with my macros has been challenging, especially as I have had family visiting, this has meant lots of meals out and a brunch. I have however made healthier choices when eating out, and I’m now more aware of what I am eating, for example instead of ordering a pasta dish or burger and fries I have been thinking of my macros and what I could get to fit them. I have chosen to eat more meals containing lean meats, like chicken and fish as well as generally eating more vegetables. Overall just being more aware of what I’m eating has helped, and I have still felt satisfied with my choices. Step by step, I am making small positive and manageable changes to my lifestyle. Phil told me from the beginning that adherence is key. Making small sustainable changes to my diet and exercise will improve the chances of it becoming part of my lifestyle rather than just a short-lived fad, increasing the chance of longterm success, he was right. 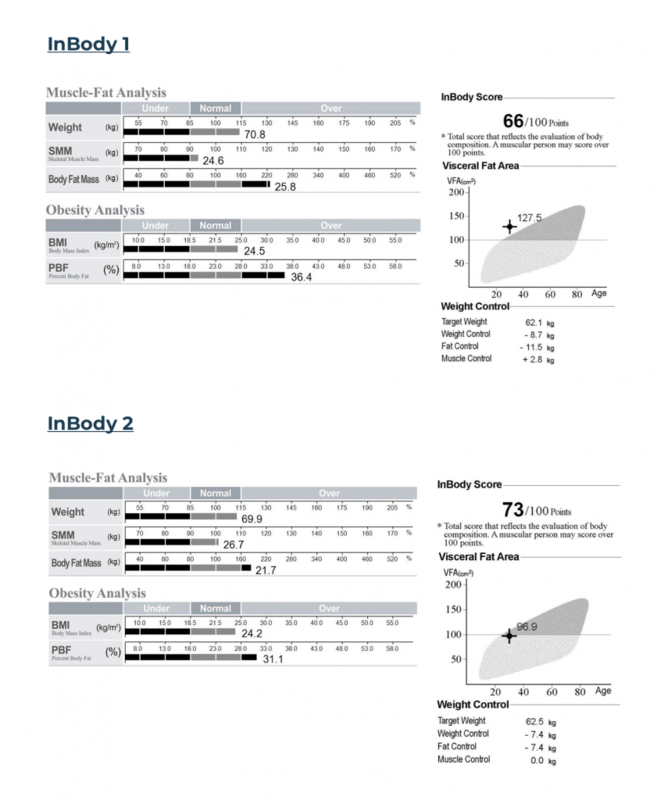 I have recently had another Inbody analysis to check my progress. Although I have not been 100% compliant with my macros/diet I was blown away with my results. In just 6 weeks I have lost 4.1kg in body fat and gained 2.2kg in lean muscle mass. My original visceral fat score (fat located around the organs) was high, and the most shocking result from my first Inbody, thankfully this has improved and incredibly I have lost 30.6 cm2, I am so happy! My Basal Metabolic Rate has also improved, I can now consume 60 calories more per day, and lets face it that is always good news! Although I have not lost much scale weight, the Inbody results are proof that my body is changing and improving, I am learning not to obsess over the weight on the scales and concentrate on my program and nutrition. “Just trust the process” says Phil. Seeing your results in black and white is such a great motivational tool and it is making me more and more determined to work towards my goal. It has helped me gain the confidence to get back into my bikinis instead of hiding myself in an all-in-one costume at the beach or pool. I am feeling really positive, and if these are the results after just 6 weeks then I am really excited to see what results I will get in the next 3 months. To anyone that is thinking about starting a fitness journey and is feeling lost or apprehensive, go for it, we all invest in clothes, shoes, makeup, hair, nails. Why not invest in yourself? The results you will get from working with a great trainer is worth every second of hard work and determination and feeling more confident in your own skin is priceless! 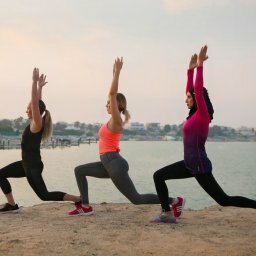 This programme has now become part of my daily routine and I find that I now look forward to working out and even the soreness that comes afterwards. 1. Invest in your health and fitness. 2. Don’t obsess about the scale. 4. Get support from a professional trainer. 5. Lifting weights won’t make you bulky. 8. Track your food, you will be amazed at how much you will learn! 9. Set yourself realistic goals. 10. There is no easy way to improve your body, it takes hard work and determination!